The February/March issue of Globe White Page's Intellectual Asset Management has now been published (details here). 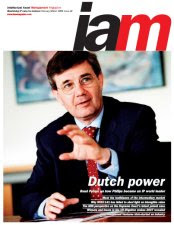 The cover story is a review of the IP strategy of Dutch electronics giant Philips, and there are articles on the establishment of patent divestiture programmes, the growth of the market for "intellectual property intermediaries" and the patent brokerage activities of Intellectual Ventures. There is also a critique by Thayne Forbes (Intangible Business) of the five years during which the US Statement of Financial Accounting Standards 141 has failed to provide the desired level of information relating to the value of corporate intangible assets. Accompanying this issue is a 245 page supplement, IP Value 2008: Building and Enforcing Intellectual Property Value that contains an impressively wide range of contributions, many of which have only tangential relevance to IP value.